Sometimes I think we worry too much about neck shape. So my hands are large and I'd like a thicker modern Gretsch neck. Does that mean my hands are too big for a mandolin? Perhaps CV, but Chet had big hands and did just fine with a mandolin. "Sometimes I think we worry too much about neck shape." Neck shape can be an extreme fundamental that I believe is a major aspect in deciding on a purchase. It's a case of the right tool for the job. Have you ever tried to accomplish a job that requires a specific tool that you don't have. Sometimes you can get the job done using something else to jury-rig but it's awkward. The right tool makes the job a snap by comparison. Regarding the neck, we've [previously] discussed fret size, action height, string type and gauge and those concerns are considered personal and a personal necessity, and I contend the same personal necessity should be applied to the neck's shape as no two people's hands, grip and playing style are identical. In my case I extend the neck's 'personal necessities' to include string spacing which I've change from the original so that new even spacing puts the low E string closer to the edge, when I have the nut replaced (with bone) on an acquired guitar. My hands are small as in a ladies large golf glove just fits. (although I use a mens small) However, my "playing quality" stalled which led me to my my first non-Strat....the Gretsch Black Phoenix. It's wider and chunkier and that turned out to be the medicine that got me back on track and improving. I feel more comfortable with wider necks...I love them greater than 1.7" at the nut but if not, then the "Louisville slugger" profile of some Les Pauls have also worked out nice and love my '14 LP Traditional which is .95" inches at the 1st fret and 1" at the 12th. I just make too many mistakes on thinner and narrower necks. So I think what was mntioned above as deep body depths of the Gretsch hollow bodies might detract any player who is smaller/shorter. Not all of course as Deed pointed out but I think if it feels good then the player will roll with it. I think because of consistent quality, the Gretsch brand is in a very sustainable place right now and the Electromatics are really a great bargain. Hi all - just seeing this thread now, adding some thoughts. My background is in design, ergonomics and biomechanics. What is being said here about guitars applies to products in a wide range of categories - from automobiles to hardware tools, sports equipment to surgical tools. For many companies, and entire industries, females are not well considered. Which means (looking on the positive side) huge opportunities. In addition to my own design work I run a design collective called 4B (4 billion females in the world) - we help companies and organizations get better at addressing females, and in general be more inclusive. Touching a bit on that topic, I wrote this article about guitar necks last year, for Premier Guitar magazine - which included the fact that "A large male hand is approximately 27-percent bigger than a small female hand. A large guitar neck (such as a Fender U-shaped neck) is only about 17-percent thicker than Fender’s standard thin neck. Therefore, typical neck thicknesses don’t span a range as varied as players’ hand sizes." (It's discussed in the 3rd, 4th and 5th paragraphs.) Note that this can affect both ends of the spectrum. Also, as a general practice - we never design for the average - that would miss half the population. We need to consider the spectrum. And we often need to think globally, a factor that further widens the range of size variations. So...we STILL need some actual numbers. What dimensions are we talking, and how many are needed for a range of neck profiles that will fit more hands? Thinking ahead to implementation ahead of that geometric data to an imagined time and place where guitars can really be customized to a player's physical needs, it's obvious that guitars with bolt-on necks can more easily be custom-ordered than guitars with set necks. Like magnitudes easier: a guitar company simply keeps some inventory of the various necks, and when an order comes in for something out of the ordinary, they either build the guitar or sub the neck on existing inventory. For set-neck guitars, boy howdy. It's probably unrealistic to imagine Gretsch (or anyone) maintaining inventory of whole finished guitars across a range of neck specs. There's also a whole marketing-and-fitting process to consider - and a hidden complication. Bicycle shops would figure out what frame fit the body. But the local guitar store is no longer a given. There are some big box stores left, and they could be the "Fitting Centers." But most people buy from internet, and few have 3d solid modeling printers to extrude neck samples from online files. So the very process of deciding on a profile would be ... well, at least less hands-on than would be ideal. Which brings me to the hidden complication: choice paralysis. When one size does not fit all, decisions have to be made - and often by people who lack sufficient expertise (or knowledge of the product) to make the decisions. I know I lose bridge sales because I have too many models, for too many applications, with too many parameters to account for. And one result of choice paralysis is to make no decision at all. The process can become so stressful and bewildering the customer just gives up - either on the brand which presents Too Many Choices, or the whole enterprise. Which leaves a perfect hole for the brand to step into whose marketing promises With our miracle design, one size fits all. No more worries about all those measurements! So there are conundrums to go along with the opportunity. On the other hand, plenty of items we've now trained ourselves to buy online present as many choices. Marketers can provide decision tools via their websites; I would imagine that, if one were selling multiple guitar neck designs, one would create a table matching physical height, arm length, finger size, and other relevant parameters to particular neck recommendations. It would be a place to start. Gibson is legendary in offering neck/ year models so you know what you're getting. As the pictures show neck size doesn't seem to be much of a factor for the girls, they're adaptable and just chasing cool. I see a lot of guitars that were purchased new from the internet and they all need about $100.00 investment to make them ready for prime time. The fattest neck profile I currently have is my 2016 Les Paul R8. When I first played it I loved how it filled my larger than average hands. But I do find my hand tiring faster as to quickly moving fingers takes more effort. I don’t know what sort of neck I like. I’m learning to just adapt to whatever I’m playing. I have a good bit of sympathy for the OP's point about more direct marketing to women, even though obvs lots of women do use the brand. For example, I would love to see one of the foremost keepers of that great Gretsch Sound featured in some marketing. She's a rising star for sure. Lovely long slender fingers and apparently has no issue with the guitar's size or neck. My GF digs the SSLVO V neck, and can’t stand my WF thicker and longer scale neck. Hell yeah! She's got it going on, Joe! Superdave / Baba Joe - Thanks. Sweet playing, nice and smooth. I like it! I'm no expert, but I think scale length, radius and fret size are more of a factor than the neck shape. Of course we all have an ideal preference, but personally there's only one neck ive found to not work for me over the course of many guitars with many shapes and sizes, mostly fender and gretsch. The only one I found to make me make more mistakes was a "slim taper" gibson neck with huge frets, it was unreal how skinny it was. Oddly, the fattest neck ive ever had was my Kramer 84 Baretta reissue, it was a baseball bat for sure. 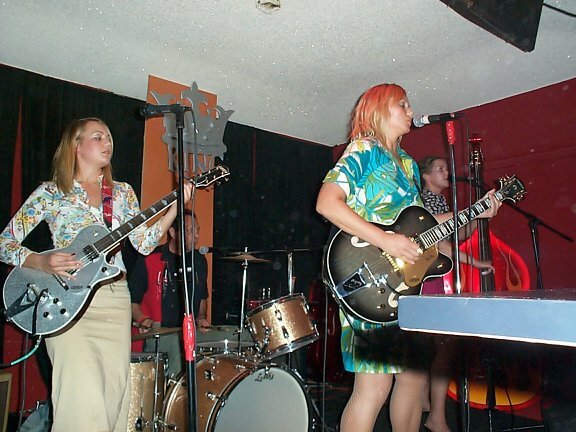 Way back in the early 2000's maybe 2002/03 The Slaptones were Gretsch artists, IIRC that is,They now call themselves Baskery ,minus dad on the drums.